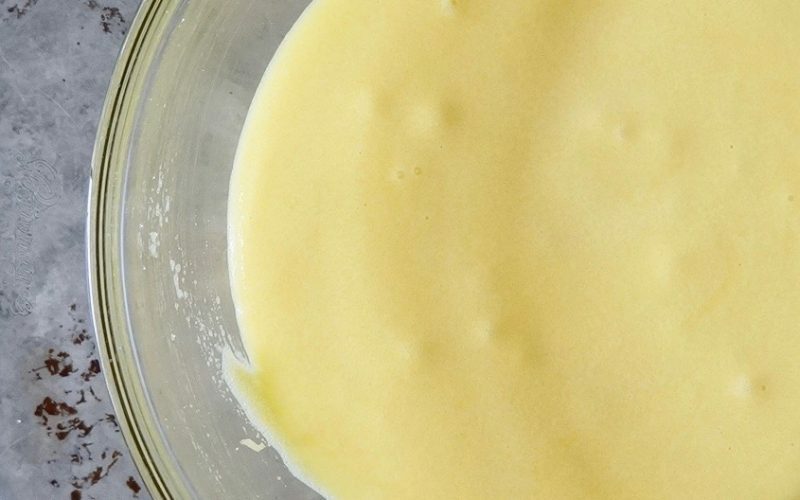 A rich custard prepared with egg yolks gives ice cream its signature, indulgent texture. When a simple flavor combination is desired, you cannot go wrong with vanilla & a vanilla bean is what will send the taste to new heights. 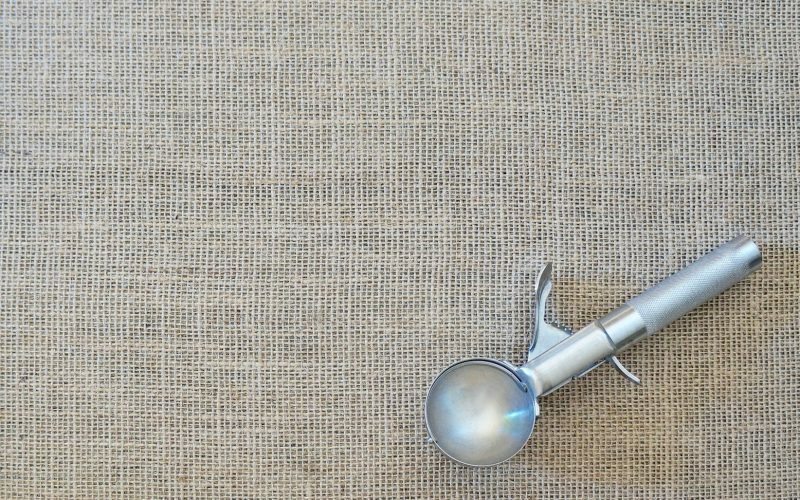 A paste can be used making it quick to add while steaming the milk without the need to scrape the pod. 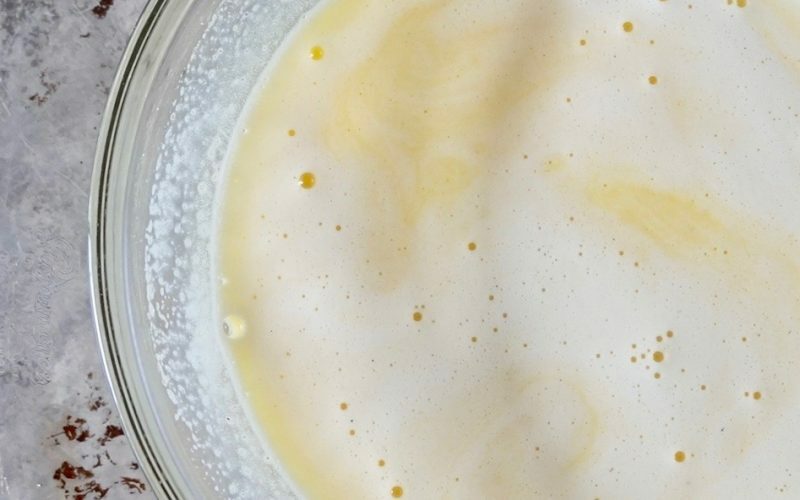 Buttermilk-Vanilla Ice Cream has an extra layer of goodness stirred in after cooking that gives it additional depth. Indulge in this summertime treat alone or sandwich between homemade chocolate cookies for a delicious variation to Classic Ice Cream Sandwiches. 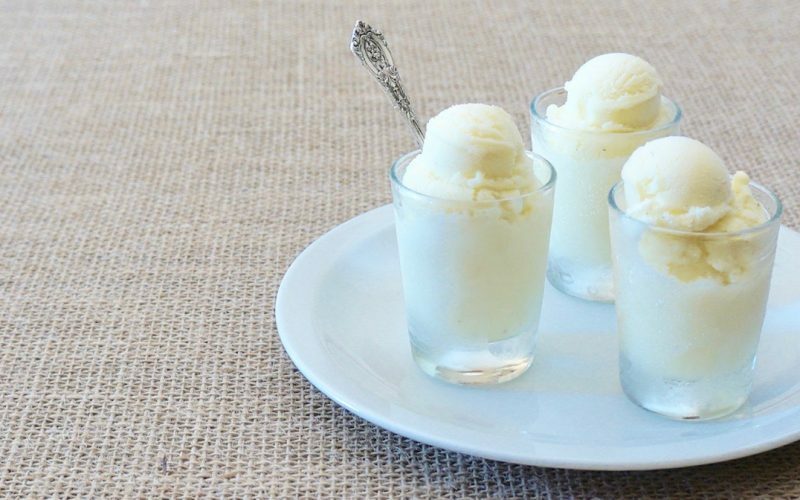 Learn how to make vanilla ice cream from scratch by following my detailed tutorial. This particular recipe was prepared using an ice cream maker featuring a bowl that must be frozen at least 24 hours before using. Although the mixture becomes firm according to the standard freezing instructions, churning it twice produces a creamier texture. Proceed as desired. Freeze the base to the ice cream maker 24 hours. Place a 9 x 5-inch loaf pan in the freezer. Fill a very large bowl half full of ice & a bit of water. Set aside. 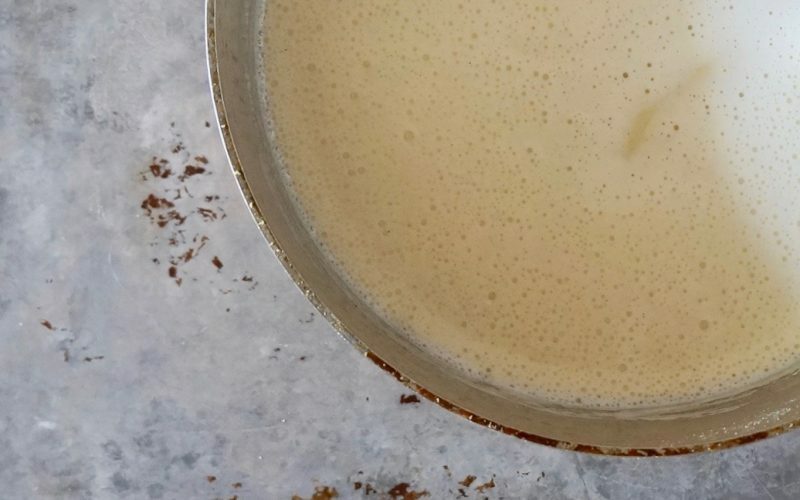 Pour the milk into a 3 1/2-quart saucepan; stir in the vanilla bean paste. Place the saucepan over Medium-High heat. Cook until steamy & bubbles form around the edges of the pan, about 6 minutes. Meanwhile, whisk together the egg yolks & the sugar in a large stainless steel or glass bowl. Slowly pour 1/2 cup of the hot milk into the egg mixture whilst simultaneously & vigorously whisking until incorporated. Repeat twice. Pour the mixture back into the saucepan & whisk until blended. Cook over Medium heat, stirring constantly with a wooden spoon all over the bottom of the pot until thickened, about 8 minutes. The cloudy surface will dissipate & the mixture will coat the back of the spoon. Remove from the heat & stir in the buttermilk. Pour the mixture through a fine wire mesh sieve into a container & place it into the bowl of icy water. The mixture will begin to cool & thicken further. Let stand 10 minutes. Remove the container from the icy water. Chill four to 24 hours. There will be approximately 4 cups of ice cream base. Freeze according to the ice cream maker manufacturers instructions. Transfer to the cold loaf pan. Freeze 24 hours. Meanwhile, wash the ice cream base & place it back into the freezer. Freeze 24 hours. Remove the ice cream from the freezer. Allow to stand at room temperature until half of the mixture melts, about 20 to 30 minutes. Stir well. Freeze according to the ice cream maker manufacturers instructions. Transfer to a cold loaf pan. Freeze 4 hours or until firm. There are several quality ice cream makers on the market that can be used to churn sherbet, ice cream & sorbet. The key to success is to follow the basic instructions provided by the manufacturer. Many of the modern machines require the base to freeze at least 24 hours before churning to forgo the need for ice & salt which makes the procedure quick once it’s time for freezing. This particular style also makes clean up effortless– just a rinsing & refreezing of the base is all that is required. 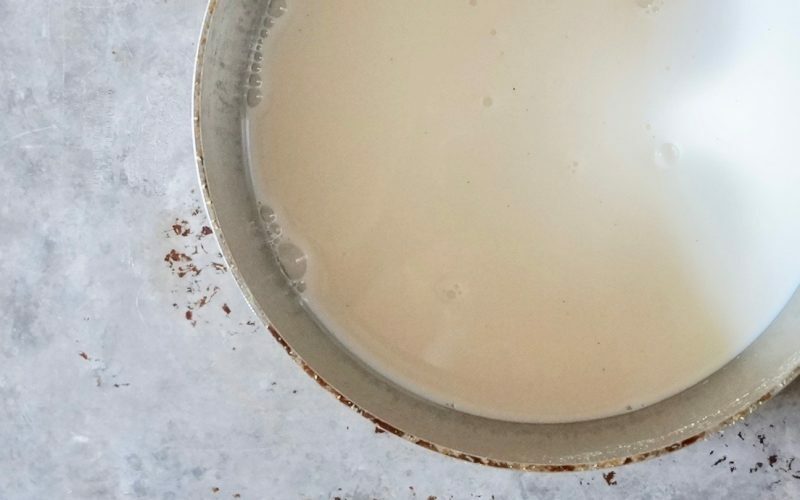 Make note of the capacity being certain to stay within the range of the amount of a formula that may be churned at one time as it will expand during the process. If too much is used, it will not freeze properly. 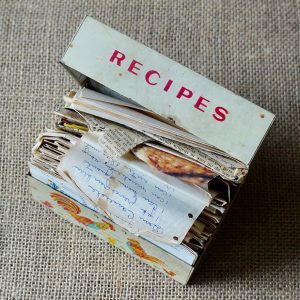 Start with an extremely cold mixture of ingredients. Once churned, quickly transfer it to a well chilled container & place it in the freezer right away to further ensure success. Freeze the base to the ice cream maker 24 hours. Place a 9 x 5-inch loaf pan in the freezer. Fill a very large bowl half full of ice & a bit of water. Set aside. 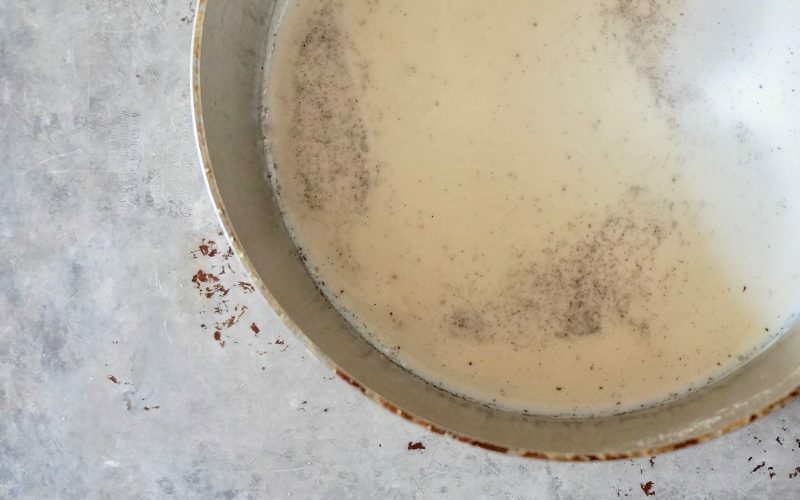 Pour the milk into a 3 1/2-quart saucepan; stir in the vanilla bean paste. Place the saucepan over Medium-High heat. Cook until steamy & bubbles form around the edges of the pan, about 6 minutes. 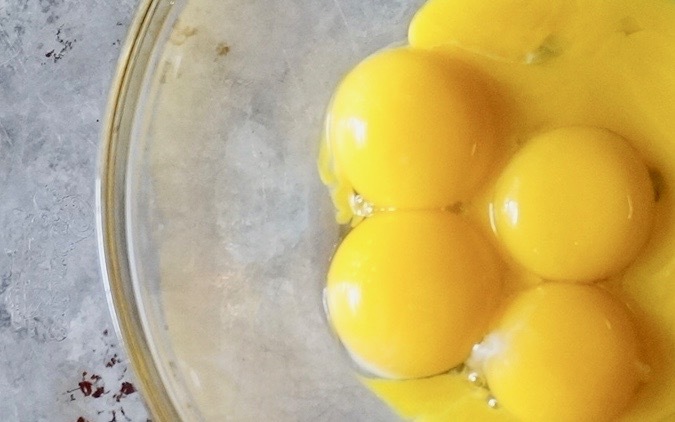 Egg yolks add richness to ice cream. 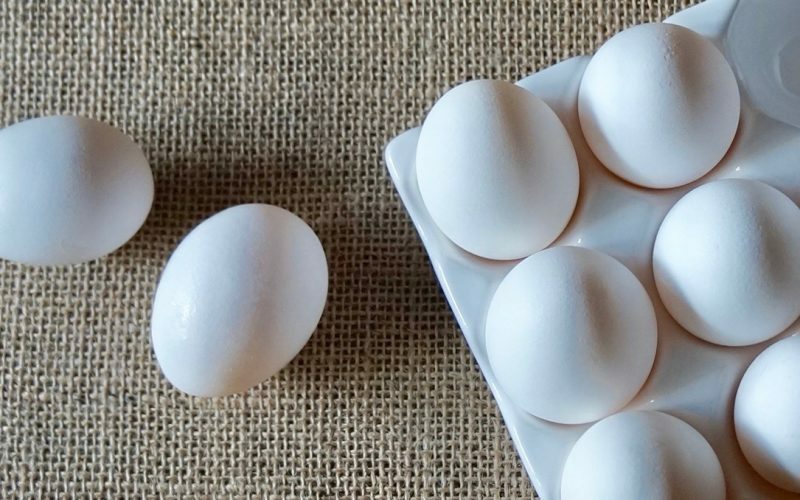 Look to The Basics: Eggs for details on how to separate the yolk from the egg white. 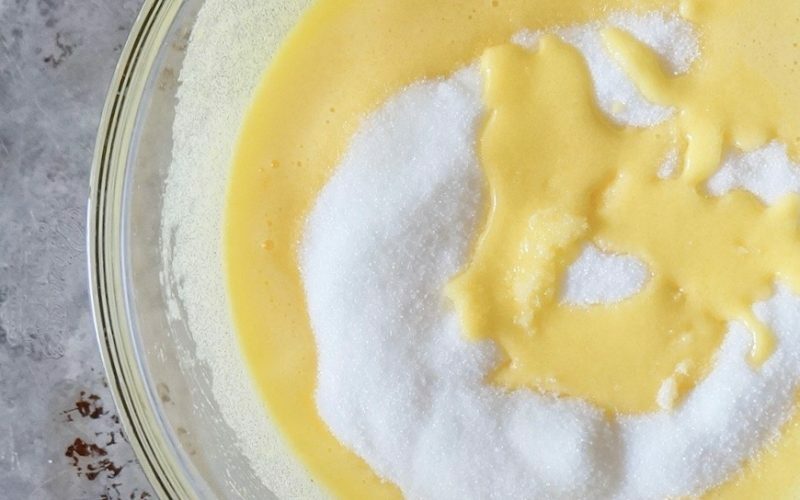 Meanwhile, whisk together the egg yolks & the sugar in a large stainless steel or glass bowl. The mixture should hold a ribbon a few seconds when lifted from the mixture. 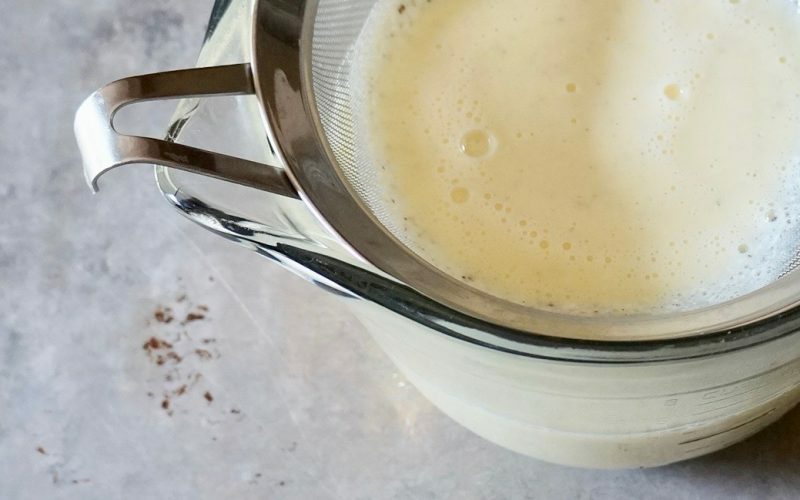 Slowly pour 1/2 cup of the hot milk into the egg mixture whilst simultaneously & vigorously whisking until incorporated. Repeat twice. Pour the mixture back into the saucepan & whisk until blended. 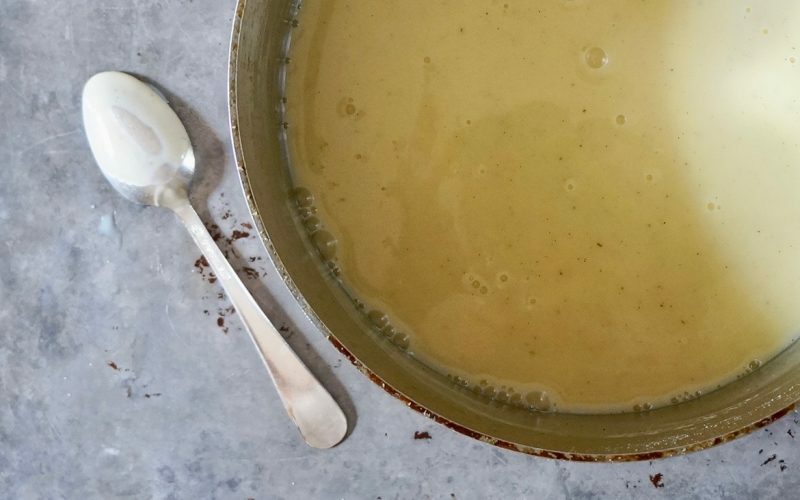 Cook over Medium heat, stirring constantly with a wooden spoon all over the bottom of the pot until thickened, about 8 minutes. The cloudy surface will dissipate & the mixture will coat the back of the spoon. Remove from the heat & stir in the buttermilk. Pour the mixture through a fine wire mesh sieve into a container & place it into the bowl of icy water. The mixture will begin to cool & thicken further. Let stand 10 minutes. Remove the container from the icy water. Chill four to 24 hours. There will be approximately 4 cups of ice cream base. Once churned, allow the ice cream to set in the freezer properly before serving. 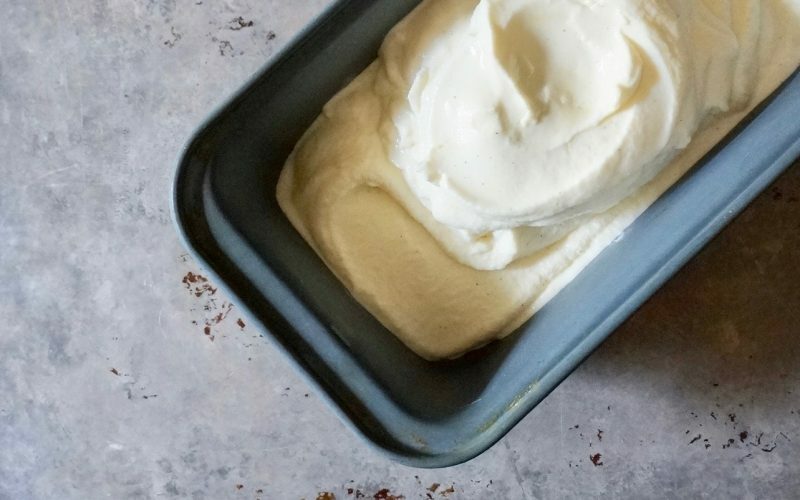 A loaf pan makes portioning the ice cream effortless. It provides a compact space & good surface area when it’s time to scoop. Freeze according to the ice cream maker manufacturers instructions. Transfer to the cold loaf pan. Freeze 24 hours. Meanwhile, wash the ice cream base & place it back into the freezer. Freeze 24 hours.